Yeah, it really is! It’s been an awfully long time since I last posted on that poor critter, in fact over six weeks, and this time I have some stunning visuals, courtesy of the go-to guy for skeletal drawings, Scott Hartman – blogs at skeletaldrawing.org. Having played around an awful lot with my awesome digital Plateosaurus skeleton I soon found that there were many more uses for it than simple digital range of motion (ROM) analyses. Or using it as a basis for CAD model, which can then be used to check center of mass and so on. One thing that was fun to do was helping colleagues in South America who contacted me about a Riojasaurus mount. How to place the body and limbs? Given the fact that P. and R. are both fairly closely related “prosauropods” one might be tempted to just c&p the posture of one to the other. Given the fact that the limbs of R. look much more sturdy than those of P., one might be tempted to place it into a typical sauropod posture, with fully erect and pillar-like limbs. 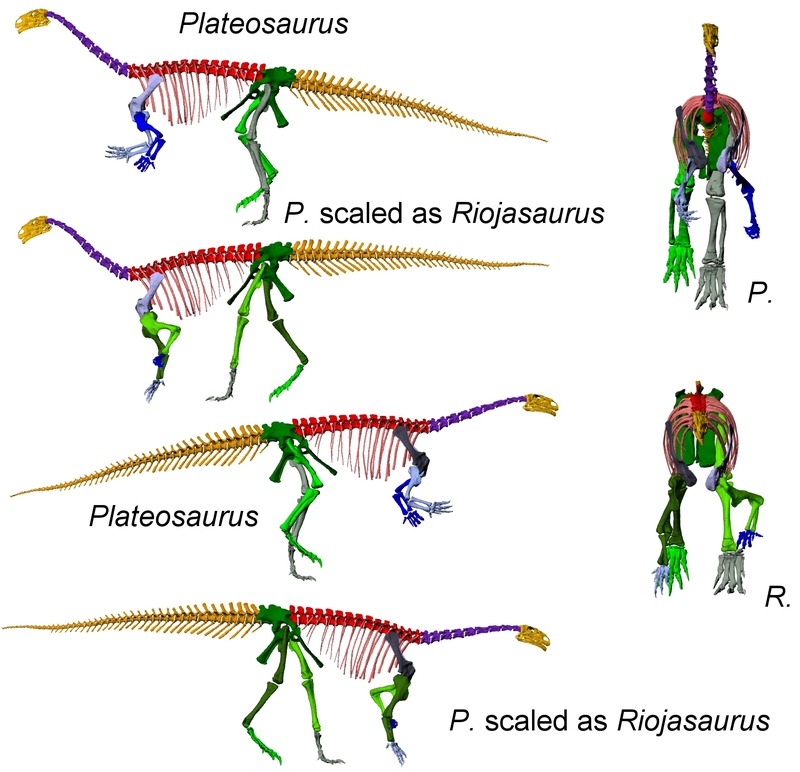 As can be clearly seen, Riojasaurus has a much longer humerus than Plateosaurus. That alone may not mean too much, but don’t forget that I scaled isometrically. That means that the scaled-up bones are not as study proportionally for the bigger animals as the normal sized ones are for the small one – the real bones of R. are a lot more massive, too. Additionally, the forelimb of R. are over-proportionally thick, thus even more sturdy than if I had scaled allometrically. That’s indicative of rather massive forces acting on the forelimb. But that’s not all: I now used R.-scales limbs on my P. digital mount. Pretty obviously, R. makes a much better quadruped than P.! of the three, Massospondylus is the smallest, and Melanorosaurus the largest. It’s easy to see how the forelimb and the shoulder girdle are much more massive and more sturdy, as well as larger in Melanorosaurus. Unsurprising, as Melanororsuarus is much closer to sauropods than the other two. Interestingly, it has the proportionally shortest neck….. weird! This entry was posted in "Prosauropoda", 3D modeling, Dinosaur models, Dinosauria, Plateosaurus, Sauropodomorpha. Bookmark the permalink. It´s very interesting the neck. 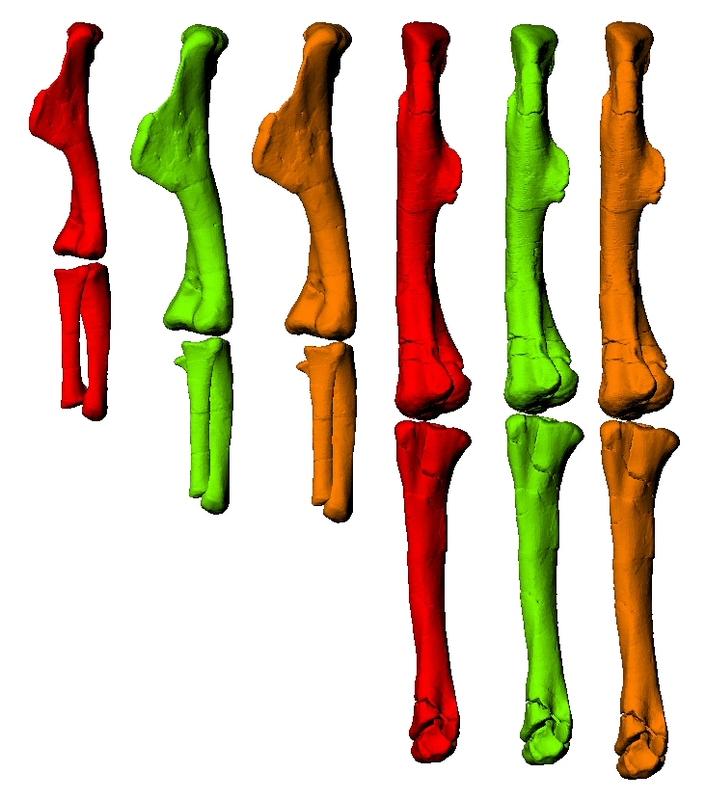 But, it is also interesting the hand and humerus evolution.